Constructed: after 36 or 31 B.C. Almost every known type of Roman honorific monument was built for Augustus on the Forum. In this way Augustus was able to make himself omnipresent, portraying himself in the role of the victor. Alongside the equestrian statue on the Rostra (see Rostra Augusti) and the honorary arches (see Actium Arch, Parthian Arch), the construction of the Columna rostrata – the honorary columns decorated with naval rams – was intended to carry on the tradition of an especially venerable form of honorific monument on the Forum. Apparently Augustus immediately received four such Columnae rostratae for his victories at Naulochos (36 B.C.) and Actium (31 B.C.). From the second half of the 4th century B.C. on, the honorific column was seen as an especially prestigious type of honorific monument in Rome. 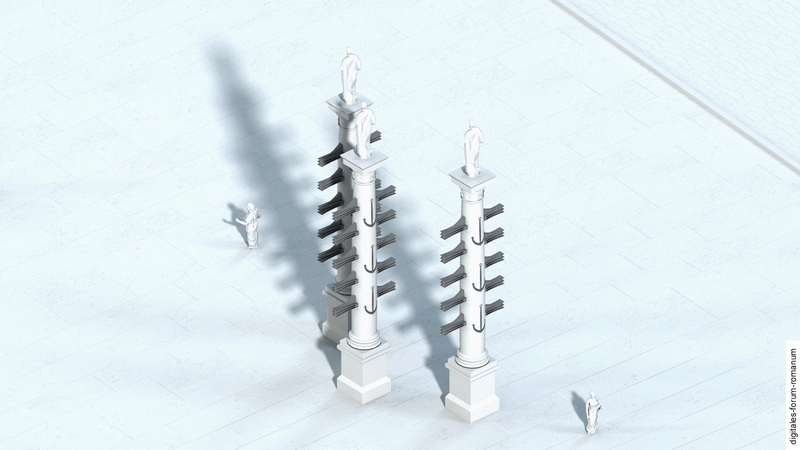 The column acted as a base that elevated the statue of the honorand high in the air and made it stand out from the other honorific statues. The first honorific column was given to C. Maenius in 338 B.C. and erected at the Comitium. Compared with this column, the Columna rostrata were more advanced: Because they were decorated with naval rams (similar to the rams that were displayed at the speaker’s platform at the Comitium), they took on the significance of a monument that celebrated a naval victory and portrayed the honorand as the victor of a sea battle. 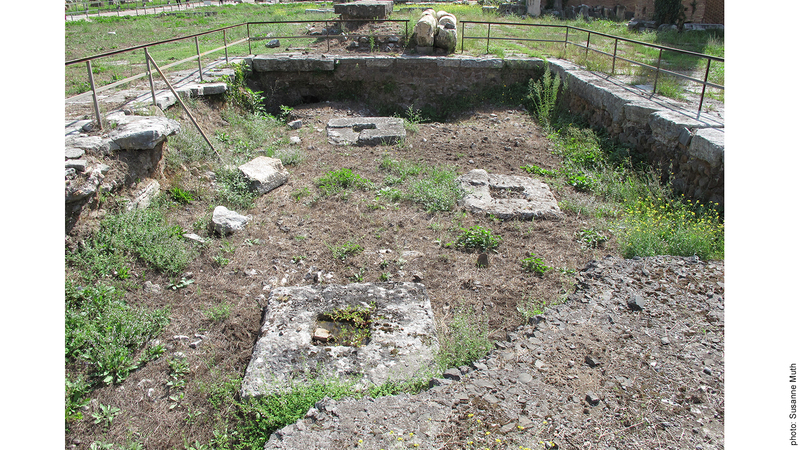 C. Duilius was the first person to be given such a column, which also stood on the Forum (also at the Comitium). During the extremely tense period of the Second Triumvirate, when different politicians tried to secure their position of power in Rome (after Caesar had been murdered in 44 B.C.) and the Senate showered these politicians and generals with exaggerated honours (in order to gain their confidence), a sort of “war” of honorific monuments broke out on the Forum. All too quickly such monuments were erected for frivolous deeds and then taken down again. During this period, Augustus too received several monuments. In contrast to his opponents, Augustus’ honorific monuments persisted because he emerged as the victor of this power struggle in Rome. When Augustus rose to power, the monuments he had received for his earlier victories had to be supplemented with additional and more prestigious monuments. Hence the Forum came to be flooded with honorific monuments for Augustus. The literary sources inform us that the young C. Iulius divi filius Caesar (the lofty name for the later Augustus) received his first rostral column for his naval victory over Sextus Pompeius at Naulochos in 36 B.C. In addition, as an ancient writer of the 4th century A.D. reminds us, he and Agrippa were given several further Columnae rostratae for Augustus’ naval victory over Marc Anthony and Cleopatra at Actium. During his lifetime, this writer saw four Columnae rostratae of Augustus on the Capitoline Hill, the central sanctuary of Rome, where they had been relocated and reerected by Emperor Domitian. With the Columnae rostratae Augustus appears to have sought to establish a direct ideological connection to the old rostral column of C. Duilius from 260 B.C. It is revealing that the latter column was restored under Augustus’ reign and its position slightly altered, probably so that it could act as the counterpart to the new Columnae rostratae. Such a connection to older Republican victory monuments in the Forum during Augustus’s reign can also be attested for the naval rams on both Rostra: here the rams from Actium, attached to the Rostra in front of the Temple of Caesar, were put in dialogue with the rams from Antium, which decorated the “old” Rostra (see Rostra Augusti) transformed under Augustus. Both references to venerable monuments commemorating famous victories during the Republic had a clear aim: to associate Augustus’ victories with other famous naval victories in Roman history, and thus to glorify them (also helpful to block out the unpleasant fact that Augustus’ naval victories were in fact blood-stained victories within the Roman civil wars). These Augustan Columnae rostratae were exploited in turn during the Imperial Period as newly erected victory monuments tried to establish an ideological connection with them. It is reported that the murdered Emperor Galba received a rostral column on the Forum at the Lacus Curtius where he was murdered (although this posthumous honour was annulled by Vespasian). Furthermore, coins issued under Vespasian and Titus depicted Columna rostrata just as they had under Augustus’ rule. This prompts the question as to whether the emperor of the new Flavian dynasty also built honorific columns for himself on the Forum before the Augustan Columnae were dismantled by the last Flavian emperor, Domitian, who then had them re-erected on the Capitoline Hill. The literary sources that mention the Columnae rostratae of Augustus only cite the Forum as their location. 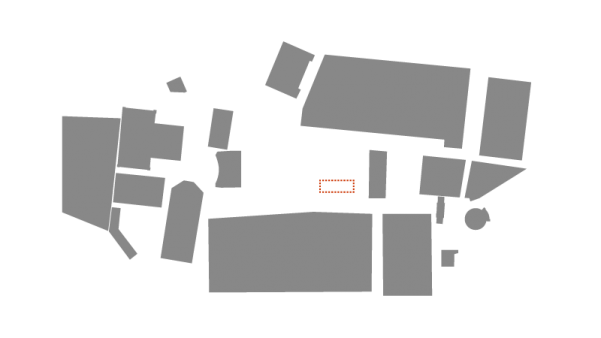 Thus several prominent locations are possible, e.g. 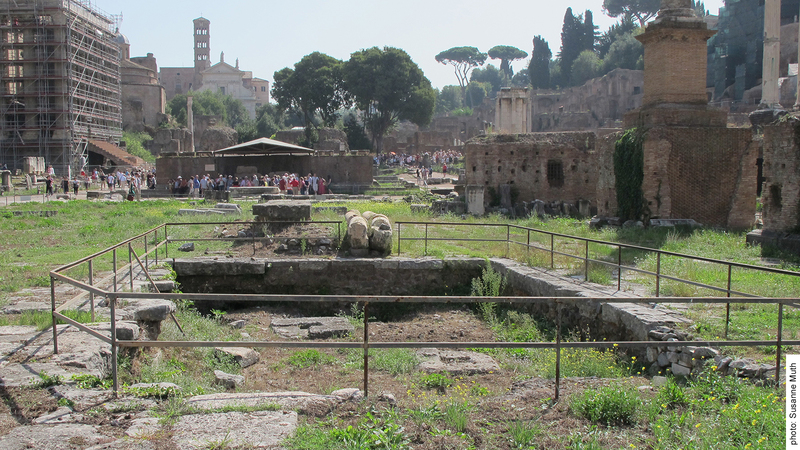 next to the Rostra Augusti / Caesaris, next to the Temple of Caesar, or on the open space in the middle of the Forum. Scholars have argued for various different locations. 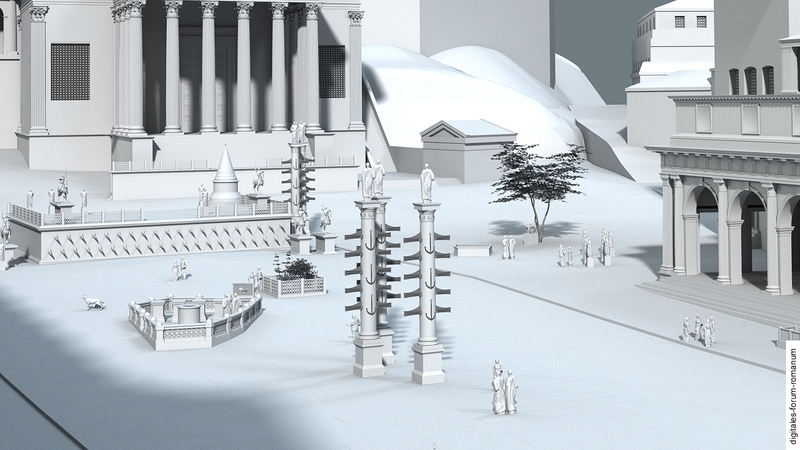 The most plausible view places three of the columns in the open space in the middle. This argument relies on both literary and archaeological sources. Domitian dismantled the Columnae of Augustus on the Forum and had them brought up to the Capitoline Hill – probably because their presence on the Forum obstructed his own construction projects. 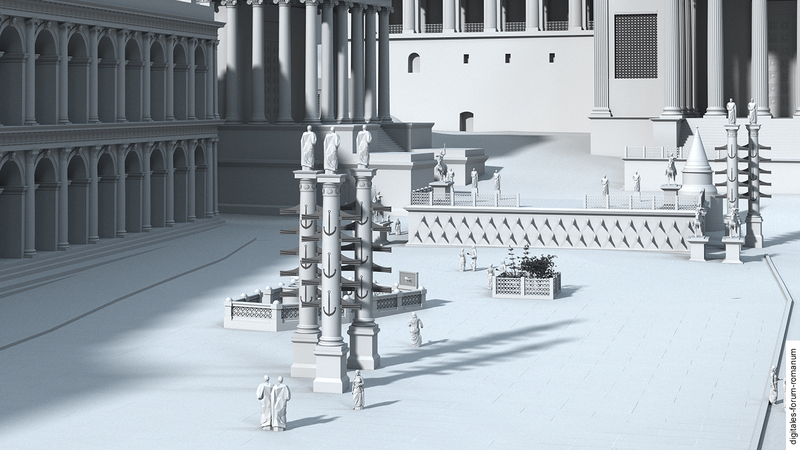 Now, directly south of the most likely location of the Equus Domitiani (the colossal equestrian statue of Domitian), a further foundation of an older monument has been found; it must have been built before the Forum was repaved in the middle of the Augustan period (around 12 or 9 B.C.). Within this foundation there are three travertine blocks, which – it seems – firmly anchored the column shafts that were placed on top of the base. 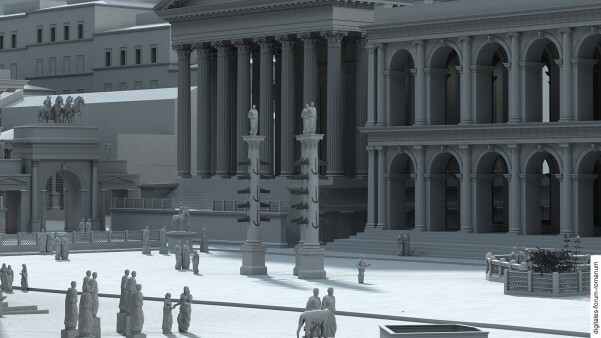 If we assume that three of the Columnae rostratae of Augustus (later including those from Actium) stood there, then we can explain why they were moved under Domitian’s reign: because they occupied the middle of the open Forum area where the colossal equestrian statue of Domitian was to be erected. If this account is correct, a further question still remains: Where was the earlier rostral column for Naulochos? In our model we have provisionally situated it close to the Rostra Augusti, possibly on the north side towards the Comitium, where it is believed that the the Columna rostrata of Duilius stood (relocated under Augustus’ rule). Because there are no extant remains of any of the Columnae rostratae, their appearance can only be reconstructed by analysing depictions of them on coins. Here an Augustan denarius dated between 29 and 27 B.C. is highly informative. It depicts a rostral column, possibly referring to the newly erected victory monument on the Forum. C. F. Giuliani – P. Verduchi, L’Area Centrale del Foro Romano (Florence 1987) 133-139. S. Muth, Historische Dimensionen des gebauten Raumes. Das Forum Romanum als Fallbeispiel, in: O. Dally – T. Hölscher – S. Muth – R. Schneider (ed. ), Medien der Geschichte – Antikes Griechenland und Rom (Berlin – New York 2014) 285-329 (302-303, 318). D. Palombi, Columnae Rostratae Augusti, Archaeologia Classica 45, 1993, 321-332. D. Palombi, Columnae Rostratae Augusti, in: E.M. Steinby (ed. ), Lexicon Topographicum Urbis Romae I (Rome 1993) 308. Y. Schmuhl, Römische Siegesmonumente republikanischer Zeit. Untersuchungen zu Ursprüngen, Erscheinungsformen und Denkmalpolitik (Hamburg 2008) 143-145, 149-150. M. Sehlmeyer, Stadtrömische Ehrenstatuen der republikanischen Zeit (Stuttgart 1999) 255-257. M. Sehlmeyer, Die Siegesmonumente nach Actium. Zur Lokalisierung des bronzenen Viersäulendenkmals (Serv. georg. 3.29), in: J. Spielvogel (ed. ), Res Publica Reperta. Zur Verfassung und Gesellschaft der römischen Republik und des frühen Prinzipats. Festschrift für Jochen Bleicken zum 75. Geburtstag (Stuttgart 2002) 216-226. B. Steinmann, R. Nawracala, M. Boss, Im Zentrum der Macht. Das Forum Romanum im Modell (Erlangen-Nürnberg 2011) 138-140. P. Zanker, Augustus und die Macht der Bilder (München 1987) 50, 86-87. M. Zimmermann, Die ‘restitutio honorum’ Galbas, Historia 44, 1995, 56-82.